3 How To Avail Appy Fizz Offer? 4 How To Use Unique Code in Paytm Mall App or Website? Hi Friends, we are again back with another offer from which you can grab Rs.100 free Paytm Voucher with every 600ml bottle of Appy Fizz !! You will get a cashback coupon, Use that Coupon to avail Rs 100 Cashback on Rs 250 Shopping at Paytm mall. Also you will get a chance to Win upto Rs.1 Lac From Offer. 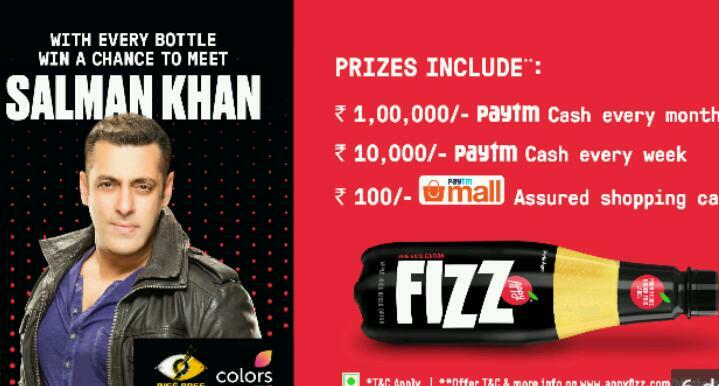 Also if you are Lucky one then You will get Chance to Meet with India’s Super Star Salman khan. Now follow the below instructions to grab this offer! How To Avail Appy Fizz Offer? 1) First visit your nearest general store and Buy 600ml Bottle Of Appy Fizz (*Ensure that Paytm Mall Offer printed on It*). 2) Find a unique code behind the Cap level of Appy Fizz 600ml bottle. 3) Now Sms this Code to 9230355555. 4) You will receive a unique code for Paytm Mall cashback through SMS. 5) Now you are the Participant If you are Lucky one then you will be Notified via Sms on this Mobile Number. How To Use Unique Code in Paytm Mall App or Website? 2) Now Purchase Anything Acc To Your Desire (minimum amount of Rs 250). 3) In promo code section while making payment of the product at Paytm Mall app, Apply that Code which you got Through Sms. 4) Click on Apply and Proceed & Place Your Order. 5) Done ! Now You will get Rs.100 Cashback in your Paytm Account. 6) The offer will ends on 13th January 2018.